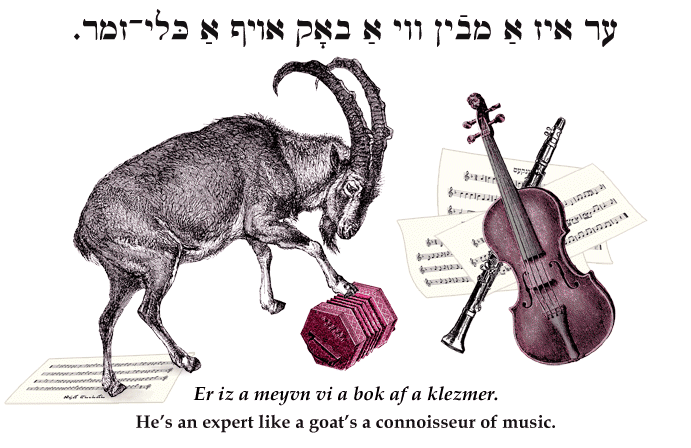 Yiddish Wit: He's an expert like a goat's a connoisseur of music. ער איז אַ מבֿין װי אַ באָק אױף אַ כּלי–זמר. Er iz a meyvn vi a bok af a klezmer. He's an expert like a goat's a connoisseur of music. He's an expert like a pig's an expert on yeast. He's an expert like a cat's an expert on yeast.